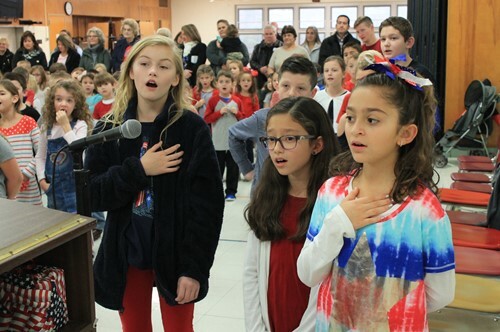 On November 12, Independence Primary School honored those who served our country by holding a Veteran’s Day program. The program began with a welcome from Principal Cynthia Ipsaro to those in attendance, including the Veterans of Foreign Wars and VFW Auxiliary staff. The assembly then said the Pledge of Allegiance and sang “The Star Spangled Banner” and “America.” A thank you message was expressed for the Veteran’s courage and sacrifice so that others may have a safe place to call home. Student Council members also presented each Veteran in attendance with a keychain made by Kiwanis K-Kids Club members to thank them for their service. The assembly ended the program by singing, “Thank You to Our Veterans.” Ipsaro asked that as everyone left, that they keep in mind the sacrifices vets made to ensure the country’s freedom.